I have done a lot of research into the hallmarking of imported watches, but one thing that had eluded me until recently was how the Swiss dealt with nine carat gold. There was a big market for nine carat gold items in the UK after it was made a legal standard in 1854, but it was not a legal standard in Switzerland until 1933, so what did the Swiss watch manufacturers do - miss out on a big chunk of the market in the UK? Not likely! Read on below for the full story . . .
Nine, 12 and 15 carat gold were made legal standards in Britain 1854. Nine carat gold quickly became very popular because it was much cheaper than the previous standards of 22 and 18 carats and could legally be called "gold". Nine carat gold contains 9 / 24 = 37.5% gold by weight, the rest is varying amounts of silver, copper and other elements to give different colours. The standards of 12 and 15 carat gold were replaced in 1932 by a 14 carat standard. The Swiss Precious Metals Control Act of 1880 specified two legal standards of fineness for gold, 18 and 14 carat. Most Swiss watches with 18 or 14 carat gold cases imported into Britain after 1880 carry Swiss hallmarks; a small proportion of 18 carat gold Swiss cases were sent to England to be marked with British hallmarks before 1888, but 14 carat cases couldn't be hallmarked in Britain because it was not a legal British standard of fineness. The lack of official Swiss legal recognition for nine and twelve carat gold meant that nine carat gold cases could not be assayed or hallmarked in a Swiss Bureau de Contrôle. This did not stop Swiss watch manufacturers from wanting a share of the large and growing market for nine carat gold watches in Britain, and there was nothing to stop them making cases from nine carat gold, but the lack of an official Swiss hallmark was a problem. Before 1888, nine and twelve carat gold Swiss watch cases could be hallmarked in a British assay office with traditional British hallmarks. This was entirely voluntary and most Swiss watch manufacturers didn't bother with the extra expense. But some did. English watch manufacturers objected to this, so from 1888 onwards new British hallmarks for imported watches with the word "Foreign" blazed across the middle were specified. This put a stop to the practice of getting any gold or silver Swiss watch cases assayed and hallmarked in Britain until 1907. This is discussed further on my page British hallmarking. This left a problem for Swiss watch manufacturers. Watch cases of 18 and 14 carat gold could be legally hallmarked in Switzerland, and these Swiss hallmarks were accepted and allowed by the British Customs authorities. But nine and 12 carat gold cases could not be hallmarked in Switzerland, so from 1888 Swiss watch case manufacturers simply applied their own official looking marks to nine carat gold watch cases, and probably to 12 carat gold cases - if you have one, do let me know. 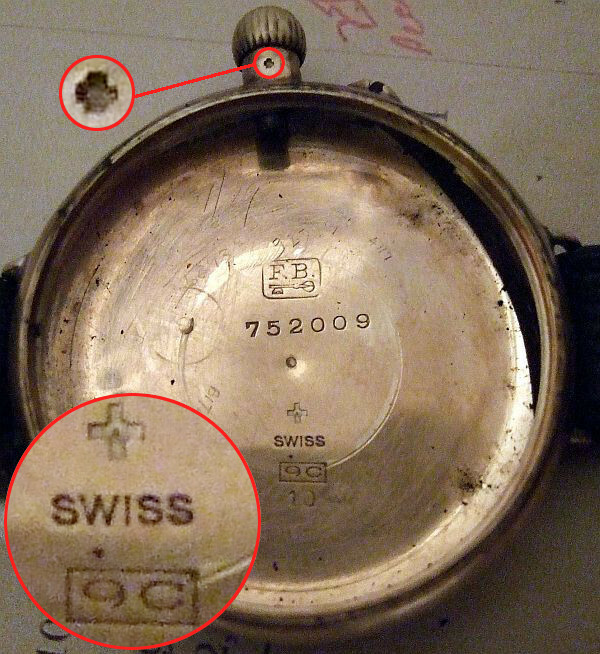 The first picture here shows a crown stamp on the inside case back of a Swiss ladies' cocktail watch. The case has stamped on the underside of both the fixed lugs a "9" on its side followed by "375". The crown mark in the image is stamped twice inside the case back. These are not official British or Swiss hallmarks, they are marks that the case maker has put onto the case that look sufficiently official that British customs and customers in Britain would be convinced that the case was in fact nine carat gold. This practice didn't stop in 1907 when it became compulsory in Britain that all imported gold and silver watch cases be assayed and hallmarked in a British assay office. The second mark is from a nine carat gold Swiss watch case with London Assay Office import hallmarks for nine carat gold. 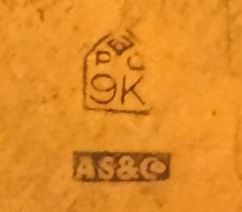 The date letter is too badly rubbed to read, but the sponsor's mark AS&Co. was entered by Abraham Shoot in 1924. In 1924 the Swiss Federal Council received to a request by the Association of Swiss gold watch case manufacturers to permit gold watch cases to be assayed and hallmarked if they were to be exported to countries where lower standards were legal. In response, on 31 March 1924, the Federal Council decreed that watch cases below the minimum legal fineness of 14 carats, but not less than 8 carats, could be counter stamped with the Swiss Federal Cross in an official Swiss Bureau de Contrôle (assay office). From 1 April 1924 an official fineness warranty character, the mark of the Swiss Federal Cross, was allowed to be stamped on 9 and 12 carat gold cases. It was decreed that the fineness should be marked either in parts per thousand such as 0.375 or carats such as "9 C" They don't seem to have used 12 carat gold at all. It appears that the case manufacturer stamped the fineness mark and the Bureau de Contrôle stamped the Federal cross after confirming the fineness by assay. The decree didn't change the legal standards of fineness for gold in Switzerland, but it meant that the Swiss Bureaux de Contrôle could test and hallmark items of below 14 carat fineness if they were for export. The photograph here shows a nine carat gold Borgel watch case with an example of these Swiss hallmarks. One interesting feature of this case is the little dot right in the centre of the case that looks like a punch mark. This has been made by the watch movement centre pivot. The cost of gold compared to other metals was, and still is, very high, the average gold/silver price ratio during the 20th century was 47:1 meaning that gold was nearly 50 times as expensive as silver. Because of this, gold cases were made as thin as possible, thinner than silver cases, to keep the cost down. This watch case has been made so thin that the back of the case can flex inwards and press onto the end of the centre pivot. Needless to say, this is not ideal for good timekeeping! Bill Whiteley kindly measured the thickness of his 9 carat gold Borgel case for me, the back of the case is 0.28mm thick. This corresponds very well with the definition of Poinçon de Maître No. 5, the Key of Geneva, which was used on gold and platinum watch cases of minimum thickness 0.3mm made in Geneva. I am sure that a bit of polishing over the years could have reduced it by .02mm. For comparison I measured a couple of silver Borgel cases and they were 0.58 and 0.56mm thick. This is one of the points that English watchmakers and watchcase makers raised with the Select Committee on hallmarking in 1878, that English watchcases had to be made thick enough to withstand the British hallmark punches, whereas Swiss watch cases that were not required to be hallmarked could be made thinner, and therefore cheaper. I haven't yet measured a 9 carat gold Swiss case with British import hallmarks to see if that was made thicker to withstand British hallmarking, but I suspect that they weren't and that the assay offices were simply more careful in their application of the punches. The Swiss authorities officially recognised nine carat gold as a legal standard in Switzerland in the Precious Metals Control Act of 1933, but only for watch cases. The hallmark for nine carat gold was a "morgenstern", which literally means morning start but is a medieval weapon like a mace consisting of a baton with a spiked metal ball on the end.